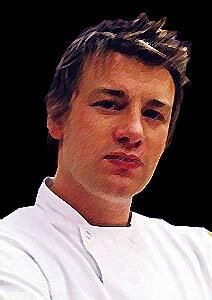 If you are thinking celebrity chefs, then Jamie Oliver is one of the first to come to mind. He became popular as a cheeky TV chef on his first BBC cooking show the Naked Chef. His parents own a pub, the Cricketer’s in Clavering, Essex, which has long prided itself on the quality of its food. He left school with no qualifications, and studied at Westminster Catering College before working as a pastry chef at Antonio Carluccio’s restaurant in London. His partner is ‘Jools’, who featured too on his first series. They are now married and have two children. He is now making a name for himslef as a hard-hitting campaigner – he has tackled school canteens and battery hens. His cookbooks sell millions a year. He runs a restuarant ‘Fifteen’, a staffed by disadvantaged teenagers trained by Oliver himself and featured on his TV show Jamie’s Kitchen. MasterChef Australia, based on the British version of the show, was a TV sensation last year. 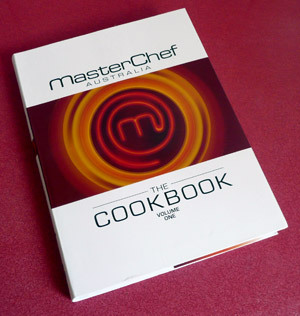 While the winner Julie Goodwin was awarded the prize of publishing her own cookbook, the show itself has produced one first, Masterchef CookBook Volume 1. 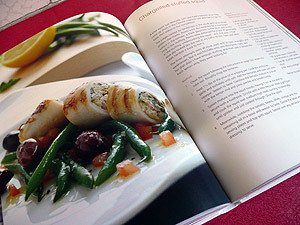 The book includes some of the amazing recipes you watched them cook. The Top Twenty contestants share recipes they created on the show, and also recipes from guest chefs such as Adrian Zumbo’s croquembouche, pannacotta, and mousse cake. Other highlights are Chris’s controversial roast pig head and his creamy ‘beeramisu’, and Lucas’s Singapore chilli mud crab. The contestants also share behind-the-scenes stories and culinary tips and tricks, and there are sections on pantry basics, kitchen equipment, knife skills, and plating up like a professional. The first word to be featured on this monthy post on cultinary terms is à la Nage – which directly translated from French means ‘In the Swim’, which refers to the method of poaching. Cooking à la nage means poaching food, usually seafood, in a court bouillon and serving the court bouillon and the vegetables around the food as part the garniture. When making a court bouillon to use for cooking à la nage, you should cut the vegetables in a decorative manner, such as julienne style. The most notable of these dishes is lobster à la Nage. When I first went to Wagamamas it was a bit disconcerting sitting side by side with your fellow diners. This is now commonplace, and it does have it’s advantages, and is part of the experience. They serve Japanese and other Asian cuisine inspired food, mostly noodle and rice dishes, at reasonable prices. Wagamama is a successful international restaurant chain, with more than 90 restaurants around the world. We have been to several, the latest was in Subiaco, WA. The restaurants are kid friendly, which is part of the attraction for us. Not only do they provide crayons and paper for the kids to play with, but all children under 12 eat for free. The children’s menu is not the standard chicken nuggets and chips, though the majority of their choices did have chicken. The rest of the menu is mostly noodle as expected, but a good choice of flavours and regional specialties. I had Yaki Soba – teppan-fried soba noodles with egg, chicken, shrimps, onions, green and red capsicum, beansprouts and spring onions. garnished with mixed sesame seeds, fried shallots and pickled ginger. It was a good as it sounds. My partner did not have such a great experience. She ordered a vietnamese beef salad from the specials menu. It came out bland with the noodles undercooked. She is not one to send back food, but she had no choice this time as it was unedible. They happily took it back and returned with the same dish cooked as it shoudl have – cooked noodles and lots more flavour. The chef apparently cooked it this time! For the kids meal, we chose chicken skewers (Yakitori), which came on a fun serve of long noodles. The staff were great, even though we moved tables to get a better view, and sent back one of the mains. Young and cheerful, they were efficient and there when needed. It was a windy evening, and we were not too sure about our choice to sit on the balcony exposed to the elements a bit. The space to ourselves and the comfy lounges made it worthwhile. It is probably easier to eat your meals seated at the long tables. Reasonably priced meals, which you would expect for a mostly rice and noodle menu. Drinks were a bit pricey, I never like paying over $7 for a local beer. It is a nice casual place to go out, and not too expensive. We will go back. This is the Croquembouche Recipe as presented by Adriano Zumbo on the MaserChef Australia website, and as featured in the MasterChef Cookbook. To make the pastry cream, place milk and vanilla bean in a saucepan. Heat gently until the milk almost boils. Remove from the heat, whisk the yolks, sugar and cornflour in a bowl until thick and pale. Gradually whisk in the warm milk. Return mixture to same saucepan and stir over medium heat until the custard boils. Spread over a tray to cool rapidly. Cover the surface of the custard closely with plastic wrap to prevent a skin forming, at 55°C transfer to a bowl and stir through butter and refrigerate to cool completely. Preheat the oven to 210°c convection. Lightly grease 4 oven trays and set aside. Combine the butter with water, sugar, milk & salt in a large heavy-based saucepan and bring to the boil. Remove from the heat and using a wooden spoon quickly beat in the flour. Return to the heat and continue beating until the mixture comes together and leaves the side of the pan. Cook, beating over low heat for 1-2 minutes to cook flour. Remove from heat and allow to cool slightly. Transfer to a large bowl. Using a hand mixer, beat the mixture to release any more heat. Gradually add the eggs, one at a time. Beat well between each addition until all the eggs have been added and the mixture is thick and glossy. Beat for a few more minutes, or until thickened. Spoon the mixture, in batches, into a piping bag fitted with a 1.25-1.5cm nozzle. Cover remaining pastry with cling film. Pipe mixture onto trays about 3cm x 2cm high leaving room for spreading. Bake for 25-30 minutes, in batches, or until firm and hollow when tapped. Transfer puffs to wire racks. Put custard into a piping bag with a nozzle less than 1cm. Poke a small hole in the base of each puff and fill with custard. For the caramel, combine water and sugar in a saucepan until it boils add glucose, and cook until caramel in colour. Remove from the heat and dip the base of the pan in a bowl of water to cool slightly. Grease a cake ring and place ring mould on a baking paper lined tray, pour ecaramel to coat the base 5mm. This is the base for the croquembouche. Dip the puff bases in enough toffee to coat and place upside down on a tray lined with baking paper. To assemble, oil the croquembouche cone. Dip the sides of the puff balls in the toffee one at a time and place around the base of the cone. Continue adding balls until the cone is covered. Transfer the base for the croquembouche to a serving plate. Place a small amount of caramel on the base. Grasp croquembouche gently and lift from the cone and place on the caramel base. Re-heat the remaining toffee then dip two forks back to back in it. Spin toffee around the Croquembouche. Decorate with violets. Are you always impressed with the fast chopping skills of the chefs we see on TV? How do they do it without losing a finger every now and then? For one, you need a sharp quality well-balance knife. Then you must grip it just above the heel for maximum control. 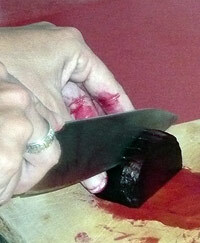 Use a rocking action with a slight push forward as the knife comes down. By tucking your fingers in, your knuckles are left to provide an edge with which you can safely guide your knife.